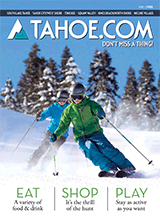 Boatworks Mall is the largest grouping of retail stores in Tahoe City. Nestled on the shores of Lake Tahoe next to the marina, Boatworks Mall is host to a plethora of different shops, including clothing stores, a yoga studio, bookstores, hair and makeup artists, home decor shops, jewelry stores and two restaurants. The mall is open seven days a week and is fully enclosed, making it a great outing when weather is nasty.